Jackie Robinson, the man who broke Major League Baseballâ€™s color line, ranks as a national icon. Filmmaker Ken Burns go so far as to compare Robinson to Thomas Jefferson. 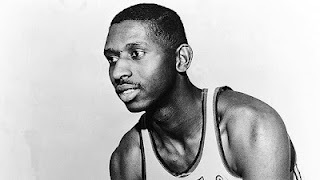 Â Earl Lloyd, the first African-American to play in the National Basketball Association, ranks as a largely overlooked pioneer. Lloyd started at power forward â€“ with an emphasis on power â€“ for the 1954-55 NBA champion Syracuse Nationals, who moved to Philadelphia in 1963 to become the 76ers. Lloyd now lives in a retirement community in Crossville, Tenn. Heâ€™s a major, if obscure, figure in NBA history. â€œIf you could have lunch with anybody who ever lived on the earth, anybody in his right mind would have to pick lunch with Jesus Christ,â€� Lloyd says. â€œMan, I would love to pick his brain. Lloyd and the man he calls â€œmy heroâ€� would have plenty to talk about. Lloyd said he encountered virtually no racist treatment from his teammates and opponents during his decade (1950-60) in the NBA. He played in a brawling era, when basketball resembled the current-day NHL. Fights were common, and Lloyd never walked away from one, but he says the punches never were provoked by his race. Lloydâ€™s memories arenâ€™t so sweet. He remembers harsh, cruel words. The Pistons played their home games in the title series in downtown Indianapolis, where the scene often grew ugly. When clueless fans called Earl Lloyd names, he declined to respond. He wouldnâ€™t even look at the faces of those who spewed hate. He used their idiocy to fuel his already considerable fire. Lloyd led the way for Oâ€™Neal and so many others. When Lloyd was inducted into the Basketball Hall of Fame in 2002, he gave credit for his climb to his coaches, his parents, his friends, his wife, his teammates, and just about everyone except Earl Lloyd. Thatâ€™s his nature. Now, he often spends his afternoons relaxing in his den while listening to the wandering, wondrous jazz tunes of Miles Davis and John Coltrane. He thinks back to his ride through life and heâ€™s filled with gratitude for those who boosted him. He sometimes sits in his den for eight hours straight, listening and thinking. â€œI like being extremely retired,â€� he says.